1 Roast the hazelnuts in a 338&F/170.0&C oven until golden brown. Let cool. 2 Grind the hazelnuts with the sugar in a food processor until the mixture has a runny consistency. 3 Add the nut paste to the melted couverture and stir until combined. 4 Temper the mixture on a marble until it has reached a pipeable consistency. 5 Use immediately or store in an airtight container in a cool, dark place. — Combine the ground nuts and sugar with melted couverture. — Stir to evenly combine. 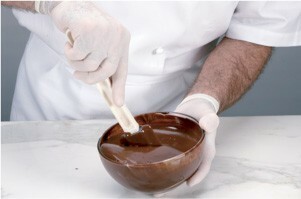 — Table the gianduja to a pipeable consistency. More sugar will make the gianduja sweeter. Using less sugar is advisable if the gianduja is for a praline filling that will be covered with white or milk chocolate. The amount of sugar should not be reduced by more than 20 percent. If the percentage of nuts is reduced, another fat has to be added to make up for the decrease in oils from the nuts. Having too little fat in the mixture could create problems during the grinding process. Cocoa butter can be added to make up for the decreased fat quantity. Adding more nuts to the gianduja will create a rich, intense nut flavor. 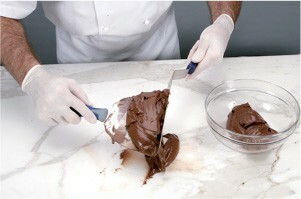 But because the mixture will contain a lower percentage of chocolate, the gianduja will be softer. More chocolate can be added to a gianduja recipe without creating any technical problems. However, the gianduja will be firmer and the nut flavor will be weaker.